1) One gift was found clearly on tipped on its side in a poor location, neither in a stocking nor under the tree leaving the recipient to potentially trip. 2) The chimney tube was bent upon exiting, leaving a gap in the joints and a potential source of toxic gases to fill the customer’s home. 3) Upon exiting the dryer vent to the roof a candy cane was dropped, resulting in waste. 4) Upon making an exit through a heating duct a screw was left on the floor as a potential choking hazard to the cat and degradation of the Santa mystique. 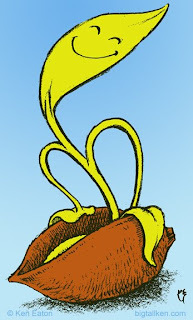 This was a spot illustration I did years ago for the Ann Arbor Ad Club , which I used to be a member of. It was part of a series of little spots that went into a mailer, encouraging people to brave the Michigan winter and see the club's gallery show. I was quite proud to receive an Addy award for them. You can see some more of them at my newly updated website, www.bigtallken.com. I'm still in the process of sorting thumbnails but felt ready to cut it loose. Following up on my previous post I just completed another job for Biker Bob's Motown. 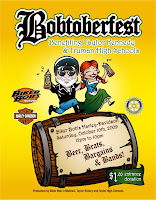 This was for their first annual Bobtoberfest event coming up in October. The first version with the barrel and steins, which is shown on their homepage, ran into problems with one of the sponsors. So I had to do a last minute change to remove the offending items and salvage the design. So, which design do you prefer? Version 1 showing drunken debauchery? 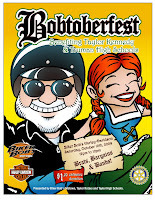 or version 2: up close and personal with Biker Bob and "friend"? I found this old pair of boxers with a motorcycle pattern I made a couple years ago for the re-grand opening of Biker Bob's Motown Harley-Davidson in Taylor, Michigan. 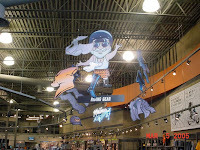 The illustration pieces were assembled into a giant mobile in their showroom. 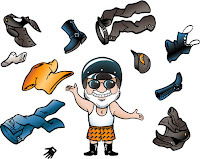 You can see more of my Biker Bob work on my please-update-me website here. 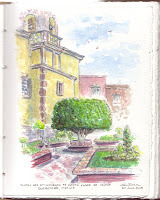 I had to travel to Queretaro, Mexico back at the end of June, and it sort of threw me off the blogging kick until now. I also decided to take a break from Illustration Friday. I enjoyed the feedback from people and checking out the work of others, but it really takes time. Prior to Mexico we took a long weekend in Saugatuck, Michigan, a favorite town of ours - not too far away, a lovely beach on Lake Michigan with dunes, some good restaurants, art galleries and antiques. I'm ready to go back already! I made this water color sketch from a photograph I took of the sunset. Not one of my best, but it was fun to get the little watercolor set out. While in Queretaro I actually had some weekend free time and used it to do these two sketches. I don't normally take the time to do outdoor sketching - or indoor for that matter! I have a difficult time with architecture and landscapes because of shrinking things down to a small piece of paper. I spent about 20 minutes on the pencil sketch and still managed to get the bell tower out of proportion, but that's how to learn. The color sketch took about an hour and a half. It was supposed to be a loose sketch but became a more detailed study than I thought. I still have work to do on perspective as well. ~ from the song, "Spark", by the Church from their album, "Starfish". One of the unique abilities we all have is to grow and transform ourselves at any time, consciously or unconciously. That was the theme behind this little guy for the recipient of the T-shirt with him on it. Here is the original sketch. I first tried to make the face part of the leaf shape, but it was looking too alien. So I took the more direct approach with the mouth and eyes. Looking at this with fresh eyes again I wish I had added more form to the seed pod with the shading. It looks a little flat. As with the drawing of the Owl and Pussycat this was a pencil sketch converted into vector format via Inkscape. It was printed on a white T-shirt with no blue gradient. 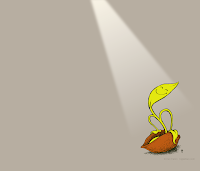 Here's a desktop image (1200 px x 1024 px) for you to brighten your day with. 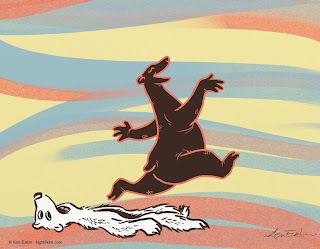 How many times have this classic odd couple been illustrated? Thousands at least based on a quick Google search. I rediscovered this blissful pair through a modern master of enigmatic written and illustrated works. I found Edward Gorey's, "Amphigorey", a few years ago in a used bookstore and became enamored. 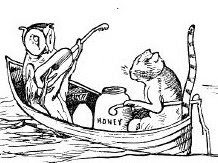 I read some biographies about Gorey where he listed Edward Lear as an influence and had illustrated Lear's, "The Jumblies" and "The Dong with the Luminous Nose." I managed to find both of these at a local library. Gorey's illustrations for "The Dong" are hauntingly beautiful with sweeping cross-hatched land and skyscapes, and I feel was his best illustrated work. After reading some Lear at the library I bought his complete works edited by Vivien Noakes. 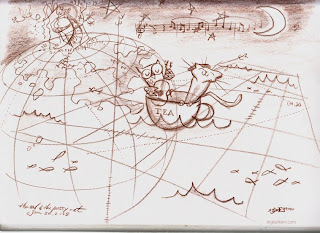 He is a very interesting character himself traveling the world painting landscapes and wildlife. If I were basing his artistic ability solely by his illustrations for his nonsense writing I would say he was the Scott Adams of his day, where his writing was his strength. However you can't always judge a book by its cover. 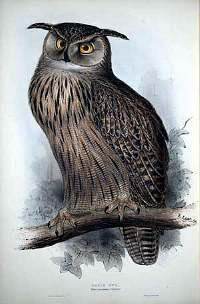 See his detailed painting of an eagle owl to see the difference. The final art is actually in vector format and was used as another Christmas gift T-shirt. To create the pencil texture I scanned my pencil drawing, loose guidelines and all, and converted it into vector format using Inkscape. Here is a detail to see the texture. This works best when you increase the contrast of your pencil scan to the point where the lines are nice and black. As I mentioned in other posts I still found it easier to color it in Illustrator. 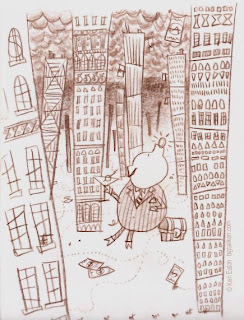 A few years ago I took a stab at trying to make a few illustrations for "The Owl and the Pussycat" blending concepts from my engineering books with the animals into a nonsense world, but I couldn't quite get down on paper what was in my head. I think I was trying too hard to force a style on myself. Let your curiosity take you places to find new sources of inspiration. And take advantage of your local library not just the Internet! 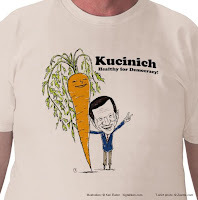 Dennis Kucinich seems to have a craving for the white house and carrots or at least carrot tops! This illustration was for another gift tee shirt at Christmas this year. I grew up hearing Kucinich's name in the news but never really new much about him. When he ran for President in 2004 I vaguely picked up that he was very left in his views, was a vegetarian and short in stature. So one of my initial doodles had him standing next to a giant carrot. While searching for reference pictures of his portrait to caricature I kept seeing him with this stunning red head. I was floored when I found out she was his wife! I still can't believe it. A 31 year age difference, and look at them! I thought this kind of thing only happened in the funny pages. It was then a short (pardon the pun) jump to turning my giant carrot into a vague representation of his wife. I'm no Steve Brodner but was pretty happy with how it turned out and so was the receiver. Even though he has a distinctive elfish look about him I had a difficult time trying to figure out which aspects to exaggerate. I think I made him look too much like a game show host. 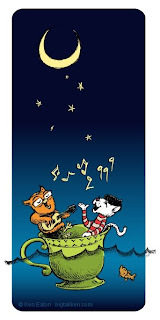 Here is what the shirt looked like when I loaded it to Zazzle. It was actually a very close representation of the final product. I used Inkscape to create the "inked" lines using the calligraphy pen tool, which I find superior for my needs to Illustrator's equivalent brush tool. When I have more energy I'll post some tips on using it. However I colored the image in Illustrator because I find that easier to do than in Inkscape. No perfect software for me yet. Inkscape is Open Source and free by the way. I recommend trying it if you can't afford Illustrator. Find out more about Dennis and Elizabeth Kucinich. They are an interesting couple of people. Maybe there will be a made for TV movie about them someday. One can only hope. Way back in November I posted some sketches of personal projects I was working on. Here is the final art for one of them. This goofy bird as well as the other sketches turned into T-shirt designs for my family at Christmas. The shirts were created through Zazzle and came out quite nice. As a warning the fitted shirts run much smaller than you think. Go large and loose with your shirts if possible! I was thinking of the brave musicians playing there last performance in the movie, "Titanic", when I drew the fish and of women from old Japanese woodblock prints for the pelican. The arctic fox's fur is highly adaptable to his environment, changing colors with the season. Check this site out for more interesting information about the little guy. Those are his tails coiled on the top shelf. 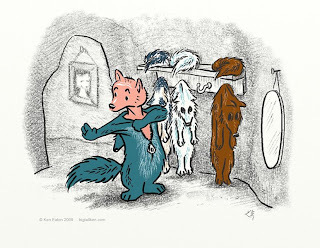 I wanted to show the coats hanging but felt no respectable fox would let his tail drag on the ground. Maybe they attach like clip on ties. The polar bear however is not quite so fortunate. It's too bad he can't just drop his coat and run free to cope with global warming! An interesting fact is that the polar bear's skin color is actually black, which helps absorb heat in the cold climate of the arctic. I was trying to find out if the skin of the arctic fox is black as well, but I couldn't find anything. Does anyone know? Like contagious the week before several ideas bounced around in my head. I had my heart set on doing a Wall Street / Humpty Dumpty theme, but time constraints won out. After looking for other cracked ideas I came up with this stripped down illustration. Read into the scene what you will. This is another T-shirt illustration I made for my other niece. Again the animals are from her Webkinz collection and the T-shirt printed through Zazzle. The creation process involved inking a pencil drawing with a brush, the scanning and converting to a line art tiff file. I converted the vile to vector format using Inkscape. I used to use an old version of Adobe Streamline. 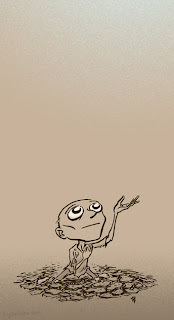 The thing I like about Inkscape is it makes all the white areas transparent, making it easier to color in Illustrator. My version of Illustrator is several years old, so the newer versions probably have improved bitmap vector converters. The colors are added in Illustrator using different layers. Drawing and editing shapes in Illustrator and layer control are superior to Inkscape's in terms of ease to use. Because my old version of Illustrator does not support PNG I have to export to SVG format, import into Inkscape to export once again into a PNG file, which Zazzle prefers. Clear as mud? 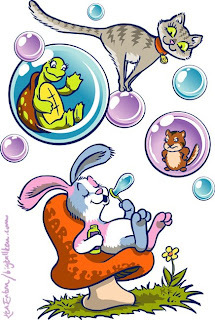 Think of this as an impromptu parade via a bunny with bubbles. I made a sketch more appropriate to the parade theme, but won't have time to finish it. 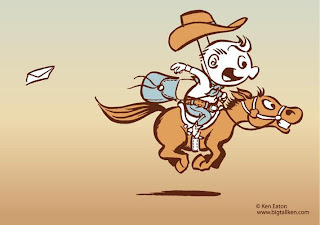 This illustration was for one of my nieces to go on a tee shirt for Easter. It's based on her Webkinz animals. I actually made several illustrations over Christmas and two for Easter as gifts for my family. The tees were made up through Zazzle. I'll post more on this later. 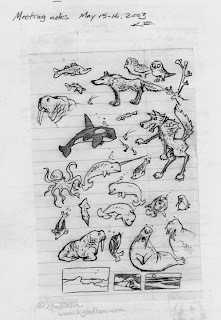 To make up for weak connection to this week's theme I thumbed through a sketchbook and found this "parade" of arctic animals. I can't believe it's been six years, almost to the day, since I made this. 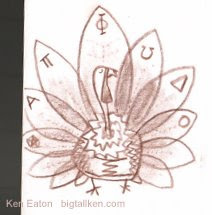 I wasn't quite as busy at my engineering job back then and would save doodles like this for posterity. At the time I was heavily influenced by Fiep Westendorp after I stumbled onto one of her books in the Amsterdam airport. She is one of many artists who've paraded through my life, littering my brain with their images, as I move on past them. It's only recently I realized the first illustration is my real stylistic comfort zone. While weeding this weekend the Illustration Friday topic, hierarchy, popped into my head. Kneeling over weeds for a couple hours I wondered who rules who? Every season I have to battle weeds in the yard. No matter how many I pull, carefully trying to get the whole root, they still come back - dandelions, violets, thistle, horsetails, what have you. You cannot go against nature. It's part of nature too. Our little lives get complicated. And that's a complicated thing. ~ from "No New Tale to Tell"
Is pulling weeds in my lawn much different from the guy chopping down trees in the rain forest for his home or farm? We curse this man for deforesting. Should we not let our lawns go wild? Let the weeds grow! Let the maple seeds sprout and reclaim their forest land! Back to Walden! (sigh)........Time to buy more lawn bags. This was for one half of my 2005 Christmas card. The other half was the "darker" side of Christmas, which I'll post next week. This is a digital color version of the original drawing. The actual card was laid out on 11"x17" white card stock paper so that two cards could be made from one sheet. 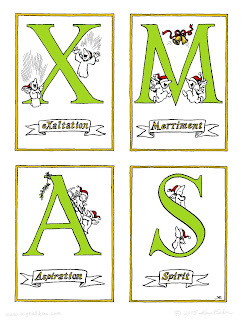 XMAS was laid out horizontally such that each letter was on it's own panel of a quad fold card. The back of the card had the dark XMAS. The theme being "keep your Christmas on the lighter side." Copies were made at Kinko's and each card had areas of green and red added with watercolor since color copies were too expensive. It's always a bit tedious making cards every year, but it's worth it for my friends and family. This year engineering work has put me behind schedule, so my 2008 cards are trickling out into early Valentine's Day cards.